NEWS: Queers Destroy Science Fiction! Kickstarter Reward Add-Ons now available! We’ve had a lot of requests for special reward packages since we didn’t offer every possible combination of items. Well, we hear you, backers! So we decided to go ahead and offer reward “add-ons” to allow you greater flexibility in backing the campaign. To add an add-on to your pledge, click the “Manage Your Pledge” button, then increase your pledge by the relevant amount. For instance, if you want to add ebooks of the Women Destroy special issues, you would increase your pledge by Pledge $10; or, if you wanted those AND the Women Destroy Fantasy issue in trade paperback, you would increase your pledge by Pledge $27 (Pledge $10 + Pledge $17). Make sense? Sound complicated? You bet it is! Which is why we didn’t offer add-ons initially. But enough people have been asking about them that we thought it would be worth the extra work on our end, and of course we want our backers to be happy! Pledge $10 Extra – Ebooks of last year’s special issues: Women Destroy Science Fiction!, Women Destroy Fantasy!, and Women Destroy Horror! Note: Women Destroy Science Fiction! special issue LIMITED EDITION in trade paperback is also now available, but it’s one of the PRIMARY rewards, not an add-on, because we have a limited quantity available. If you want to select it, you should choose it as your primary reward, and then select whatever additional add-ons you’d like. Pledge $31 Extra – Ebook subscription to LIGHTSPEED (12 issues), includes back issues 1-61, subscription begins with #62. If you already have issues #1-61, we will substitute FANTASY issues #1-58. Pledge $67 Extra – Ebook subscription to LIGHTSPEED (24 issues), includes back issues 1-61, subscription begins with #62. If you already have issues #1-61, we will substitute FANTASY issues #1-58. Note: If you selected one of the LIGHTSPEED subscription rewards, this is included with your pledge as a result of our stretch goal. Pledge $115 Extra – FANTASY MAGAZINE Ebook MegaBundle (every issue, 1-58). Pledge $120 Extra – LIGHTSPEED Ebook MegaBundle (every issue, 1-61). N/A – NIGHTMARE Ebook MegaBundle (every issue, 1-33). If you want this add-on, just grab the NIGHTMARE subscription reward either as your primary reward or an add-on. Because of our $20K stretch goal, this is included with NIGHTMARE subscription rewards. N/A – LIGHTSPEED Ebook MegaBundle (every issue, 1-61). If you want this add-on, just grab one of the LIGHTSPEED subscription rewards either as your primary reward or an add-on. Because of our $20K stretch goal, this is included with LIGHTSPEED subscription rewards. LIGHTSPEED’s 2015 special issue will be Queers Destroy Science Fiction!, an all-science fiction issue entirely written, edited, and illustrated by queer creators. It is now open to submissions. We’ll be launching a Kickstarter on January 15 to help fund making the special issue a double issue. Who are the guest editors for the special issue? Seanan McGuire is our overall guest editor and she will also be selecting and editing the original short stories (1500-7500 words); Sigrid Ellis is our flash fiction editor (<1500 words); and Steve Berman is our reprint editor. Who can submit stories for consideration for the special issue? Anyone who identifies as queer. I’m queer. What can I submit? Science fiction short stories, up to 7500 words. No fantasy for this special issue, though if our Kickstarter campaign goes well we might unlock Queers Destroy Fantasy! and Queers Destroy Horror! special issues as well. How queer does my story need to be? We very much want to see diverse queer representation and queer themes, but we are focused on the identity of the authors and the quality of the story, not the “this much queer content per story” meter. What is science fiction? At LIGHTSPEED, we think of science fiction as fiction that speculates on our world, where the basis of that speculation is science, not magic. This includes the social sciences, so dystopias are welcome, as are stories set in post-apocalyptic worlds. Steampunk is also welcome, as long as whatever is powering your cool stuff isn’t magic. How long is the submission period? Submissions open October 31, 2014 and will close at 11:59 p.m. ET on February 15, 2015. When can I expect a response to my submission? We will endeavor to reply as quickly as possible to submissions, but since assembling the special issue is similar to assembling an anthology, stories being seriously considered may be held until March 1, 2015 to allow our editors to consider everything before making their final decisions. How many stories and how often may I submit? Our usual policy of allowing authors to only submit a story once every 7 days is lifted for this issue; so while you may only submit one at a time, you can send in something else as soon as we pass on the first one. You are also allowed to submit one short story (1501-7500 words) and one flash fiction (<1500 words) story at the same time. Can I submit a rejected story to LIGHTSPEED in the future? All stories submitted to the special issue will also simultaneously be considered for regular issues of LIGHTSPEED. So if you receive a rejection for the special issue, you can consider that story having been rejected by LIGHTSPEED in general. If we end up with so many good stories we can’t fit them all in the special issue, we’ll take such “overflow” for regular issues of LIGHTSPEED. NEWS: Women Destroy Science Fiction! Chosen as the Book Club Selection for Science Fiction Book Club.org! NEWS: Women Destroy Science Fiction! Selected as the “Book of Honor” for Potlatch 24! Potlatch is a literary speculative fiction convention that happens annually and alternates between Seattle, San Francisco, and Portland. Every year in lieu of a GUEST of Honor, Potlatch chooses a BOOK of Honor. And it is our great honor to report that our Women Destroy Science Fiction! issue was selected as this year’s Book of Honor! NEWS: Forthcoming in 2016: People of Color Destroy Science Fiction! As we announced in this Geek and Sundry interview, in 2016, we’ll be assembling a People of Color Destroy Science Fiction! special issue as the next step in the Destroy project. Being so far in the future, we don’t have our guest editors lined up yet or any other details, but stay tuned to DestroySF.com for details! NEWS: Forthcoming in 2015: Queers Destroy Science Fiction! 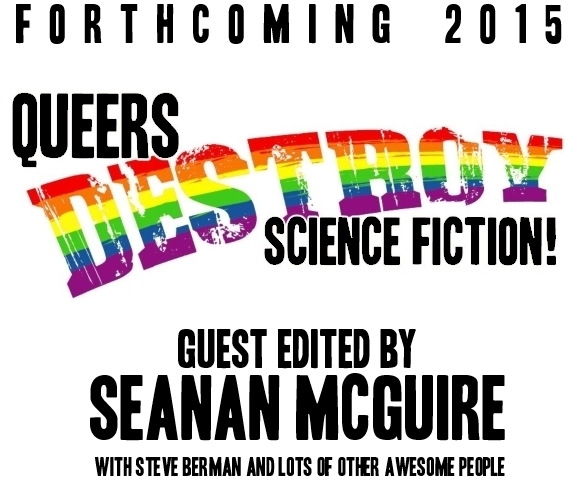 Like it says in the graphic, in 2015, we’ll be assembling Queers Destroy Science Fiction!, with Seanan McGuire on board as guest editor/ original fiction editor, and with Steve Berman as reprint editor. We’ll be opening to story submissions in the near future, and we’ll be launching a Kickstarter for QDSF in January; stay tuned to DestroySF.com for details! Want to know more? Want to help destroy? Go here. Welcome to DestroySF.com. If you’re not sure what this is all about, you’ll probably want to start by reading ABOUT THE DESTROY PROJECTS, then checking out our three special issues: WOMEN DESTROY SCIENCE FICTION!, WOMEN DESTROY HORROR!, and WOMEN DESTROY FANTASY!